Heart Failure Patients: Weigh The Risks Of LVAD Heart Devices : Shots - Health News A mechanical pump can be life-saving for heart failure patients or it can cause dangerous complications. Doctors can do a better job at explaining the reasons some patients may want to opt out. For severe heart failure patients, an LVAD, or left ventricular-assist device, helps the heart pump blood. Let's say you're one of the 6.5 million Americans with heart failure. Your heart's ability to pump blood is impaired. Despite being on all the right medicines, at doses as high as you can tolerate, your quality of life is getting worse. You're comfortable at rest, but you get short of breath with even mild exertion, and you feel weak and tired all the time. At this point, your cardiologist may suggest a heart transplant. Or if you're not an ideal transplant candidate, he or she may instead suggest a device known as an LVAD. LVAD stands for left ventricular-assist device. It's an electrically powered pump implanted surgically between the left ventricle and the aorta to boost your failing heart's ability to pump blood. The stats on LVADs sound good. Overall, they save lives and improve the quality of life for many heart failure patients. But these benefits come with a high rate of possible complications that include stroke, bleeding, infection and pump failure. That's a lot to process, and it's up to the doctor to convey the complex information you need clearly enough for you to be able to make a fully informed decision. Unfortunately, we doctors are not doing a great job of that, a recent study suggests — because if we were, fewer patients would be choosing to have these devices implanted. When they were first developed, LVADs were used only in patients with the most advanced disease, on the waiting list for a heart transplant. Those patients had heart failure so severe they required drugs known as inotropic agents that stimulate the heart to contract more forcefully. These drugs, when given continuously over long periods of time, increase the likelihood of sudden cardiac death, so they're usually used only when a decent quality of life can't be maintained without them. In patients with such severe disease, the likelihood of surviving — and the quality of that survival — was found to be much higher with LVADs than with available medications. Based on this success, the practice of implanting LVADs has expanded. It's now a "destination" therapy for patients with end-stage heart failure who are poor candidates for heart transplants. More recently, LVAD started being offered to patients with heart failure that is severe, but not severe enough to require support with inotropic agents. Among these patients, those with LVADs do better, a study published in 2017 found. I worked as a cardiologist in my university's advanced heart-failure program for 16 years. I cared for many patients in whom LVADs were surgically implanted, and I can attest to the huge benefits many of them derived from the devices. It's been common for a patient tell me something like, "I feel a thousand times better." I've even seen reports of younger patients who did so well they could have their LVADs removed. But there's more to the story, and it's sobering — particularly for those patients who are not in dire need of a transplant. LVAD patients are at risk of dangerous complications, including the infections of the power cable, formation of blood clots within the pump and problematic bleeding. Compared to patients managed with medicine alone they are more likely to have worsened failure of the right ventricle or ventricular arrhythmias, a common cause of sudden cardiac death. Most alarmingly, the incidence of stroke is 12 percent per LVAD patient-year (and as high as 30 percent in some reports) while it's about 4 percent in those without LVADs. Just as I've seen patients whose lives were restored by the placement of an LVAD, I have seen others who spent months in intensive care, only to die directly or indirectly from these complications. How can the overall positive results of LVADs square with these high complication rates? Here's an analogy: Say you're given the chance to place $1,000 on an even-money bet where the odds are actually 2:1 in your favor. So for every three people who make the bet, chances are two will win $1,000 each, but the third person will lose $1,000. The group as a whole will have bet $3,000 and walk away with $4,000, which makes for a positive outcome for the group — but one of the three will come out $1,000 poorer. These are not the odds of LVAD success rates, which depend on many variables. But the same idea applies: Statistically, you're likely to do better, but there's a serious chance you'll be made seriously worse. Of course, technology improves with time. A clinical trial published in May showed that a newer-model LVAD had significantly fewer complications. This is encouraging, but it will be important to see whether these outcomes hold true in practice — particularly because almost on the day that study was published, the manufacturer recalled the device to deal with technical problems. Heart failure patients need to be able to make a well-informed decision. And, overall, this doesn't seem to be happening the way it ought to. A recent study published in JAMA Internal Medicine looked at the effects of thoroughly educating both doctors and patients — including a video and pamphlet for patients — on the risks and benefits of LVADs. 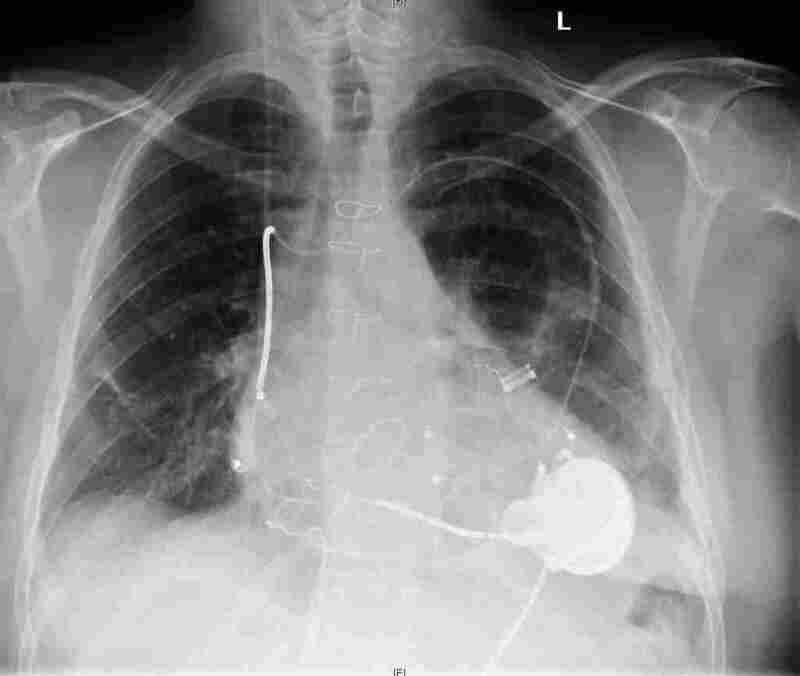 With better education, the percent of patients choosing the LVAD dropped from about 80 percent to about 54 percent. The author of an accompanying editorial notes that this finding "raises the alarming possibility that many patients ... are consenting to an LVAD without being fully aware of the risks and benefits, and may have chosen otherwise with more information." Are doctors swayed by the financial upside of prescribing this device? The devices generate huge revenues both for the device industry and for medical centers, and it would be naive to argue that this has no possible influence. And many of the medical school-affiliated authors of papers in the medical literature on LVADs disclose financial relationships with device makers. They may be paid to speak at professional meetings, for example, or they may be paid by device makers to conduct the research. But patient outcomes in advanced heart failure programs are under intense scrutiny, giving doctors a powerful incentive to try to avoid putting LVADs in patients who seem likely to suffer complications. Most importantly, doctors have a commitment to doing what's best for their patients. I have never seen a colleague promote the placement of an LVAD without believing it was in the patient's best interests. But I also see a fervor for LVADs among many advanced heart failure specialists, despite their complications and costs. At national meetings and in the medical literature, I encounter passionate practitioners who see themselves as pioneering a new era in the treatment of heart failure. They may well be right — but it's harder to be objective when you're passionate. Advanced heart failure is a debilitating disease, and those afflicted may feel deeply despondent. It's understandable that advanced heart failure specialists feel a need to do all they can to offer the patient a better quality of life, even with the high potential for bad outcomes. None of us want to say, "I'm sorry, I have nothing to offer you." What has to happen, I think, is for both doctors and patients to be open to the difficult discussions that need to take place, in which the potential benefits and risks are considered fully. That communication is hard, and the stakes are high. We physicians need to do a better job of explaining. And I urge you, the patient, to try as best you can to understand the risk you're taking when you have an LVAD implanted. Ask, for example, to see the pamphlet and video used in the study I mentioned above. Talk to other providers — not necessarily cardiologists — who have cared for LVAD patients. Talk to patients — though it's unlikely you'll have the chance to talk to those with the worst outcomes. I don't have an easy answer. It's a gamble. That LVAD will probably help you, and you may be one of the majority of patients who say afterwards, "I feel a thousand times better." But you may not. Just make sure you understand and can accept the risks before you say, "Yes." Matthew Movsesian is a cardiologist and professor in the Departments of Internal Medicine (Cardiovascular Medicine) and Pharmacology and Toxicology at the University of Utah.